I am getting ready for something that is going to be alot of fun! My sweet friend Amy owns Amelia Beadelias, a super fab beading shop in town! She has asked me come down for Third Thursday and sell my cards in her shop! I am SO excited!! 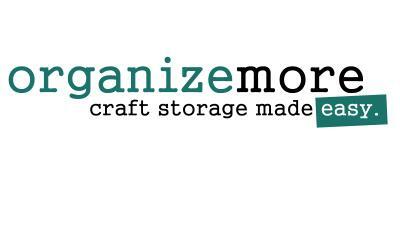 Right now I am working on some more "trendy" cards so I have a variety of styles to take with me! 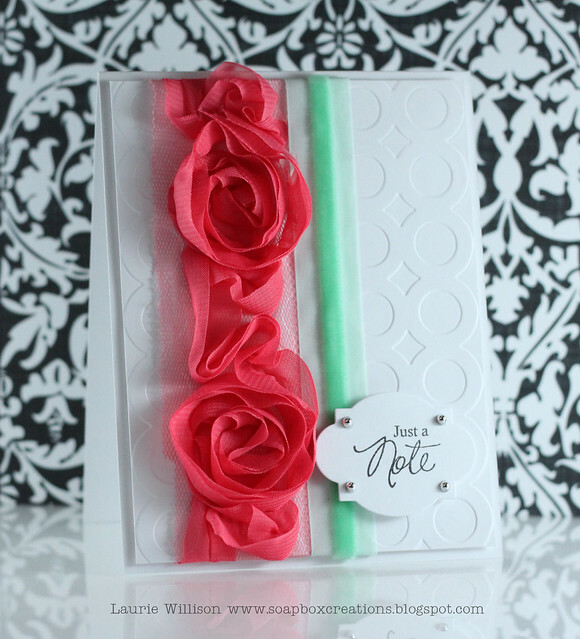 The green ribbon comes in the same package as the rose ribbon! I thought it looked like a fun color combo in itself! 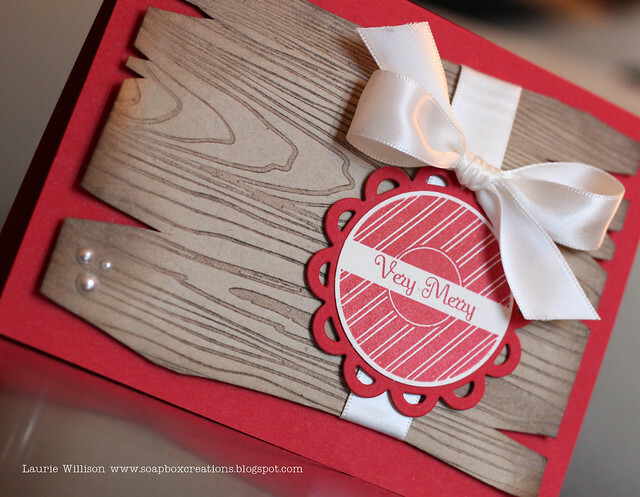 And I am a huge fan of the white layered cards with just a splash of color! So that is it for today! Thanks for stopping by! Happy Monday! (That's not always the case right? It's Monday for crying out loud!) So happy Monday anyway! And what makes it even better is a new sketch from Kazan....AND the last sketch until the New Year as Kazan and Laura have decided to take the holidays off! Now, like my blog hop tag, this tag is another big one! Again measuring 4 1/4 x 5 1/2, this is the size of a regular A2 size card. I decided maybe I am "mini-tag" challenged. 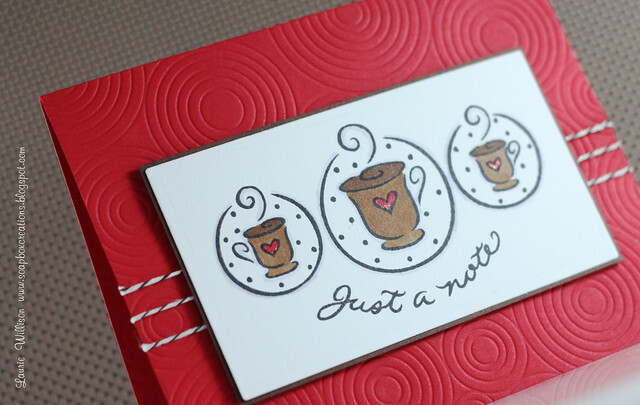 So for this tag I used various background stamps and embossing folders. 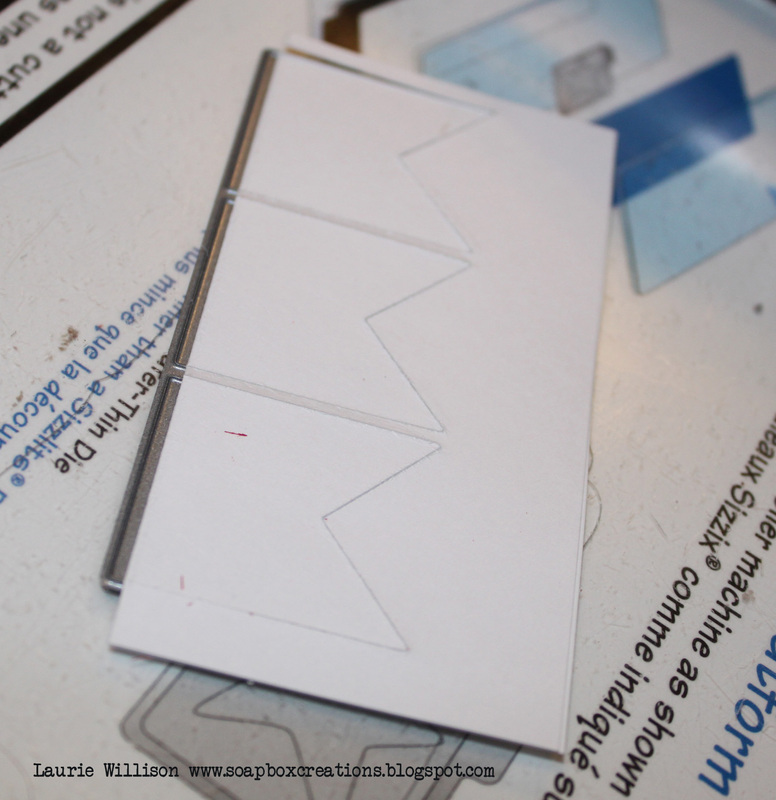 I attached each strip on to a smaller tag (tags were cut using SCAL and my Cricut!) and then matted the whole thing with the larger Kraft tag! OH...Can you see the little piece of bakers twine? I thought that made a cute little loop on top of the stocking! I used SU's embossing folder for the stocking! I was just telling Ingrid that I had never used PTI's Stocking Prints yet and was so excited to ink it up because of her inspiration! Well, I still haven't used a stocking from that set! But I did use the die! You can see I used the die 2 times! One for the full stocking in red and then I cut the top and toe off of the stocking cut in Ripe Avocado! 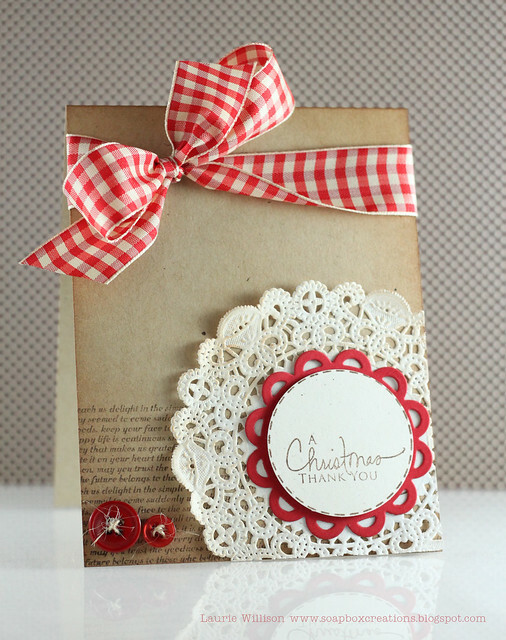 I stamped those smaller pieces with Polka Dots Basics II. As far as the ribbon on the top, I used Maile's little knot trick and then added a little more! 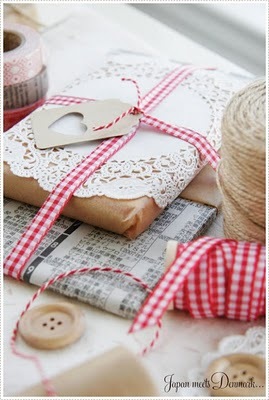 Instead of cutting off the twine I used to tie up the ribbon, I brought it around and through the button and tied a bow! I liked Jen's button she used HERE so I had to add one too! Well, that is it for me today! Hope your week is fantastic! I have lots of Christmas shopping to get done! And cleaning...I am still working on it...but I hate that part! We will see you back for the next sketch after the holidays! DIO Friday and Jay Gee's Challenges! Hello everyone! 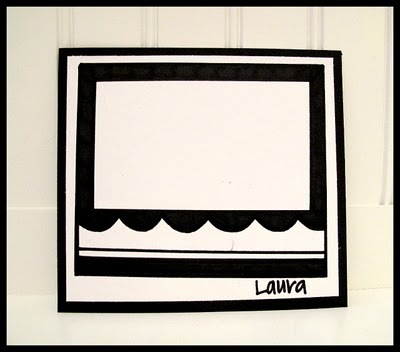 I have a card today for a couple of different challenges! Both challenge blogs are pretty new so go and check them out! The first is my blog friend Stacy! We go way back to our days with TAC! ;) She has a terrific CAS style that I love!! 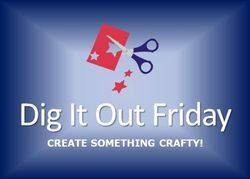 Here challenge is called Dig it Out Friday! You can see her latest challenge HERE! I have been holding on to this ribbon forever! I love the "homespun" feel of it! When I saw Jay Gee's challenge, I knew I had to pull it out! I used one of the circles from Borders and Corners, and was happy to see that it fit perfectly with the Limitless Labels circle! 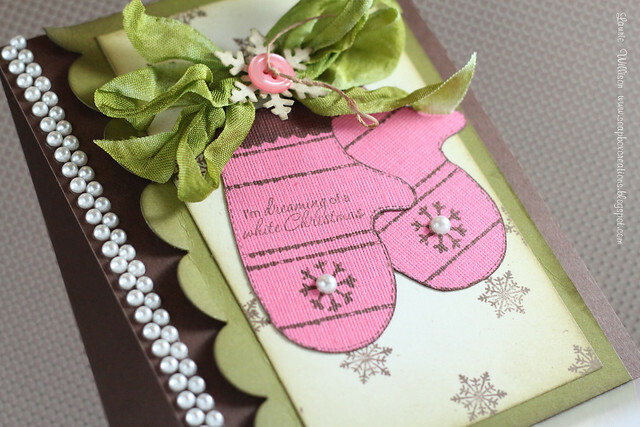 All the distressing is with Tim Holtz Tea Dye and the little applicator tool! I can't get enough of that thing! I love the soft look it gives the edges of the card! I used the "letter press" technique here again. I used Burnt Umber palette and rubbed it all over the Wood grain IP! Ran it through the Big Shot and gave it the "chopped" look! Then I used TH's distress inks to give it a more dried, aged look! Kinda' woodsy, kinda' homespun, kinda' unique I think! OH and Ted....here is another of my favorite 3-color-combo, combos! ;) Love brown, ivory and red! 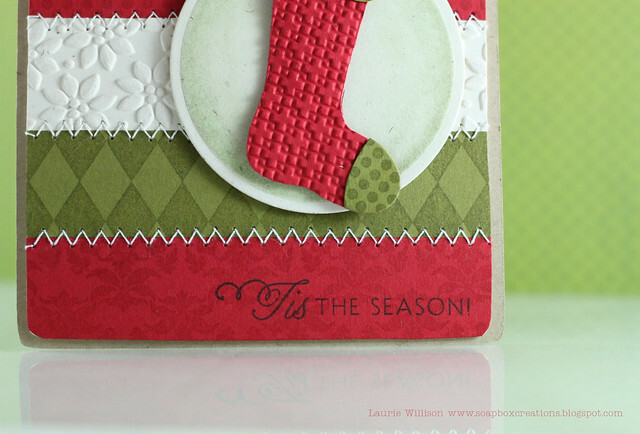 PTI November Blog Hop-Tag Time! 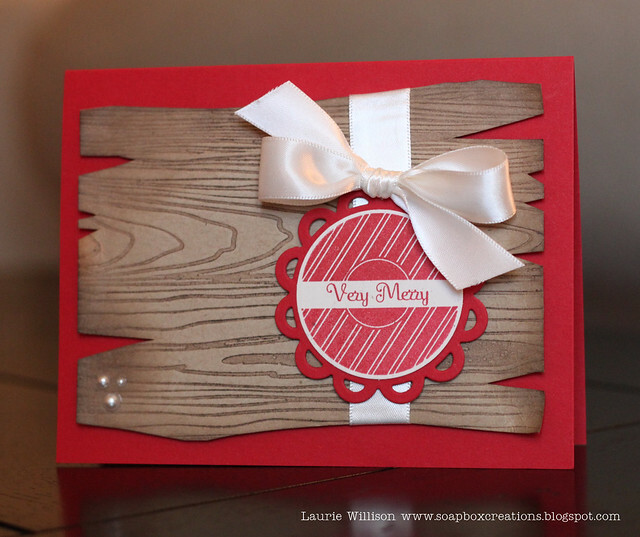 Welcome to the November PTI Blog Hop and Happy Thanksgiving!! I made a tag that is the size of a regular A2 card! 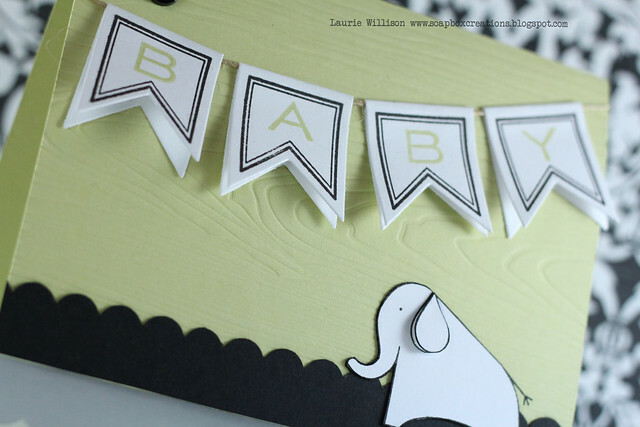 This way, it works as a card, a tag and also a decoration for the gift bag! 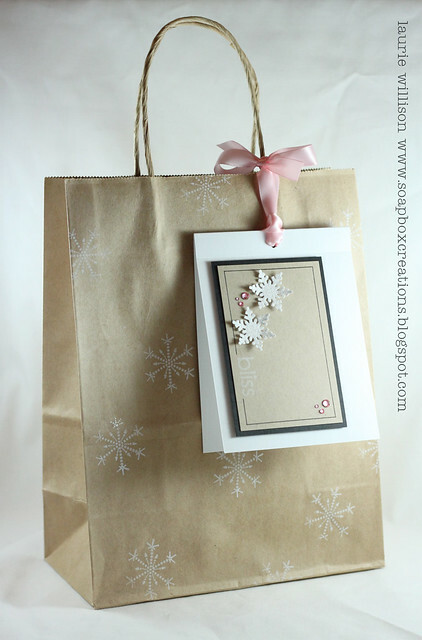 I simply stamped white snowflakes from the 2010 Christmas Tags set using Fresh Snow ink all over the bag! 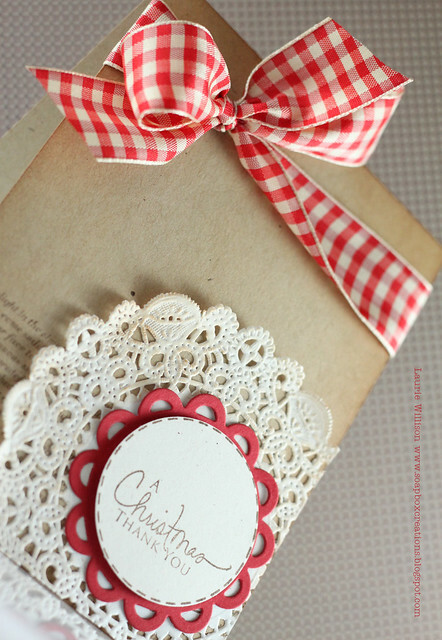 Then I made the card, punched a whole...turning it into a tag...and attached it with a piece of Sweet Blush ribbon! The snowflakes on the tag were made using a MS punch! Then I covered them in Zig Glue and a white glitter! Of course, I had to add some bling! 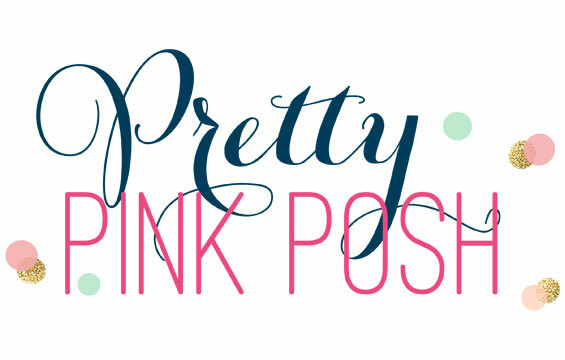 I thought pink would be a fun color combo! 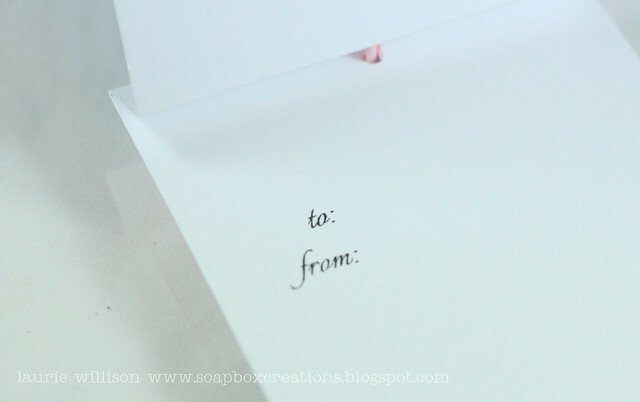 I scored a line at the top of the card to make it flip up and easy to read! And here is the inside! 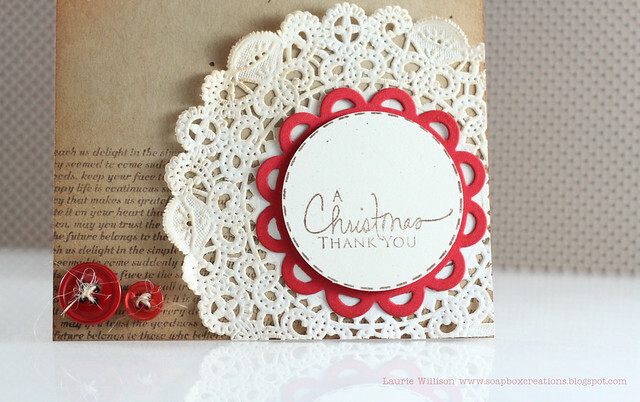 Just a simple To and From stamp from the Christmas tags set! Still lots of room for a personal message! 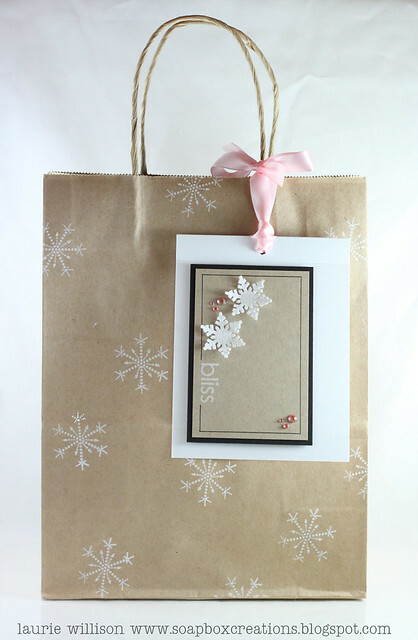 You can attach the tag to the front of the bag with glue dots, or just with the ribbon! 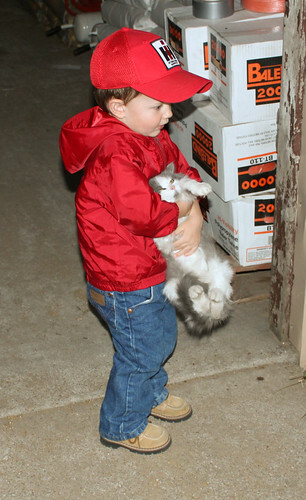 This way the recipient can save the tag! 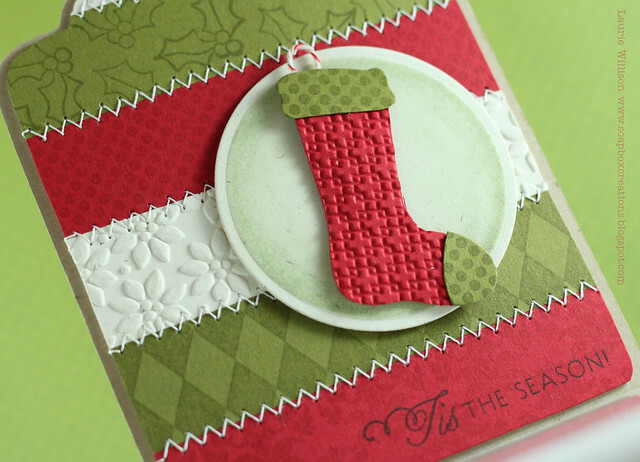 Don’t forget that JustRite also has some Christmas stamps in their newly released CLING line of stamp sets, too -- you can find all of their cling stamp sets HERE. 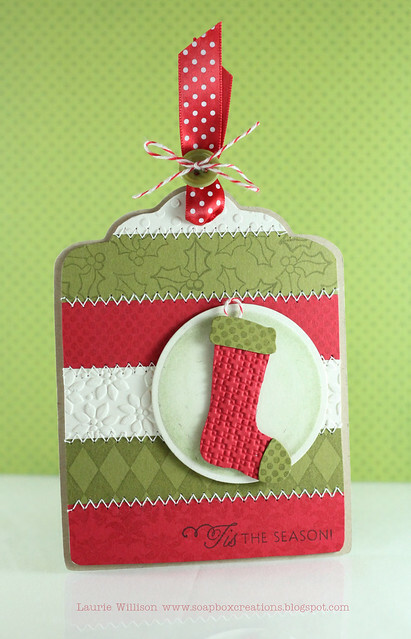 This week we, the 2 Sketches 4 You designers, get to join with the JustRite design team and share some fabulous Christmas creations! JustRite is sponsoring this week’s 2S4Y #66 sketch challenge. 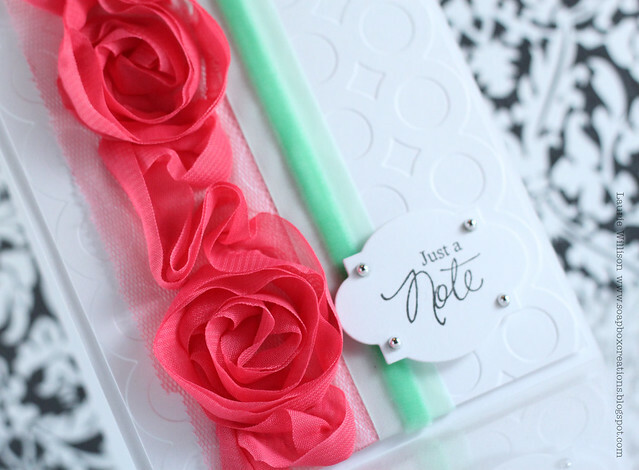 You can find the fabulous sketch inspiration AND details about the JustRite prize package, by visiting the blog post HERE. So here is my Just Rite creation! 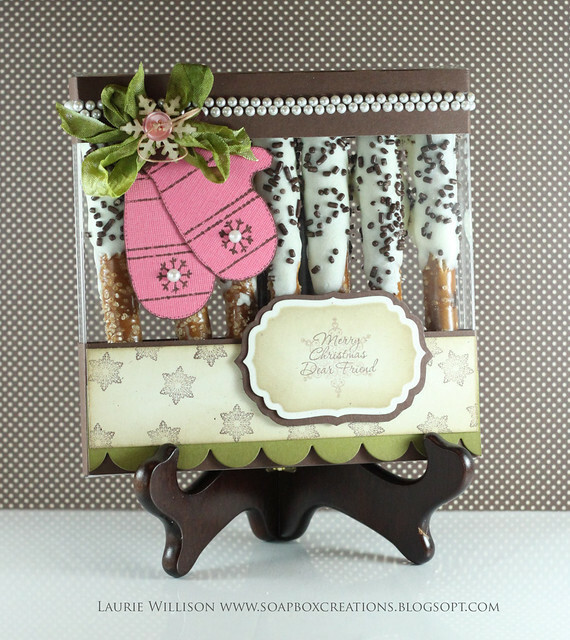 I used the Sparkly the Snowman set to create a little gift box filled with a yummy treat! This is a clear box filled with white chocolate covered pretzels! 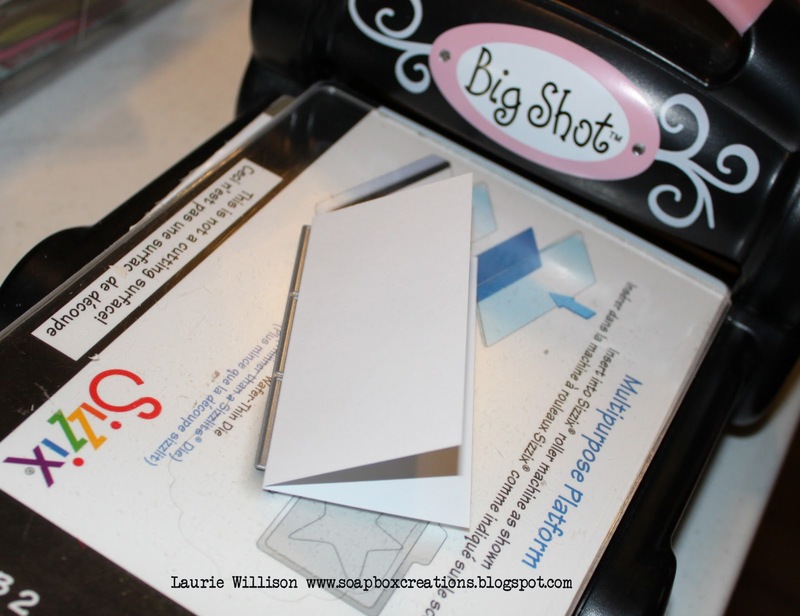 A super easy and fun gift to give! 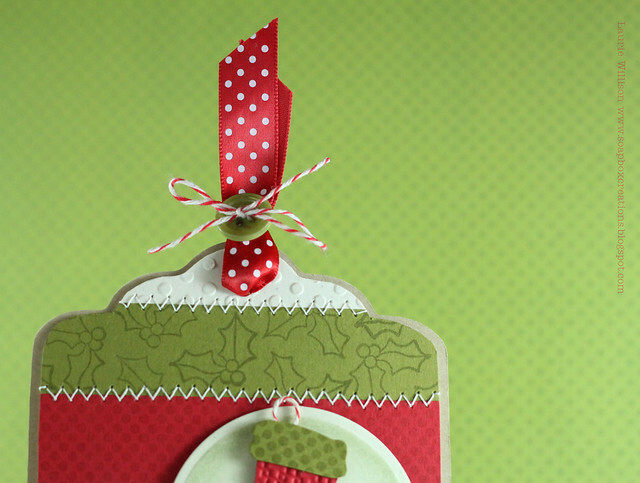 This stamp set is perfect for making some super cute Christmas embellishments! This box may look familiar to some of you! I made this card for Monday's 2 Sketches 4 You! You can see that post HERE! Now I have a matching gift set! Thank you so much for stopping by today!! I wish you all a very Merry Christmas! 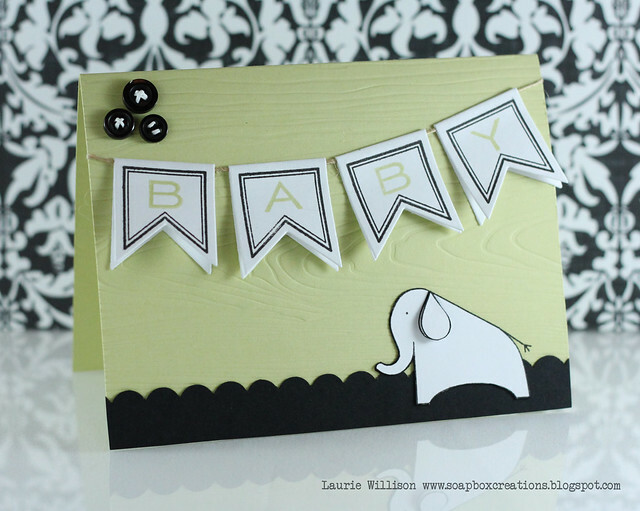 Laurie Willison -You are here! HI all!! Hope you had a great weekend!! I can't believe how fast it went by! Time for another sketch at 2 Sketches 4 You already! 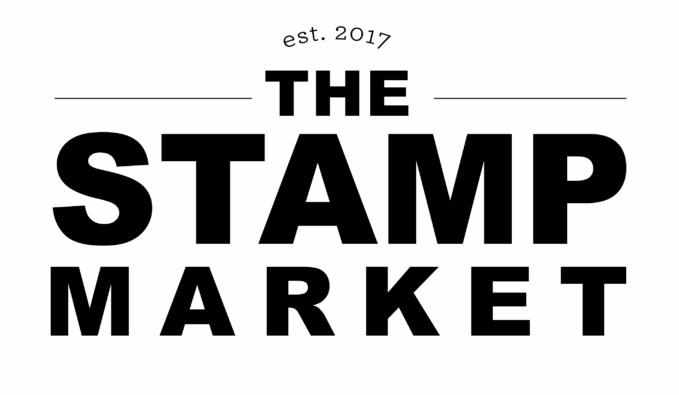 This weeks sponsor is Just Rite Stamps! How cute are these little mittens? The mittens, snowflake and sentiment are all from the set called Sparkly the Snowman. Adorable set!! I took some seam binding and colored it with a copic marker to match the Ripe Avocado cardstock! 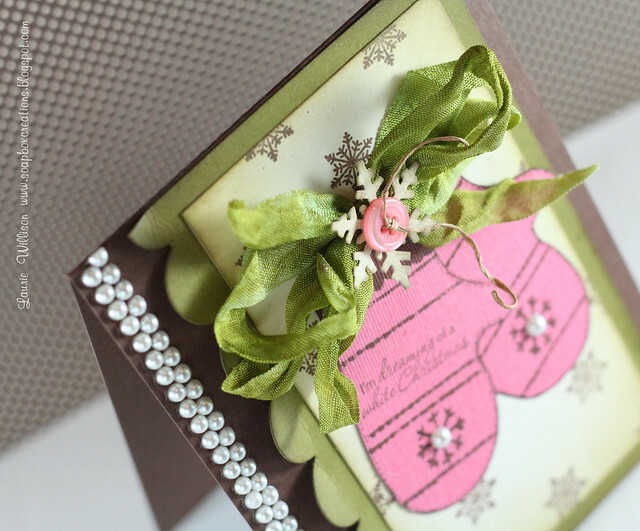 Love that bow and MS snowflake punch detail! And what about the big ole' strip of pearls? I haven't tried that before but I thought it was a fun touch! OK so I know that is cheesy but I just had to use it for my title! hehe! I did something kinda fun with these banners! I took some pictures so you can see how I did it! Just keep scrolling to see my little tut! Can you see on the elephants ear, I took a small piece of foam tape on the bottom and then attached the top of his ear to the pain part of the elephant? Cute huh? Looks like a real ear! Well you know...a real stamped ear! 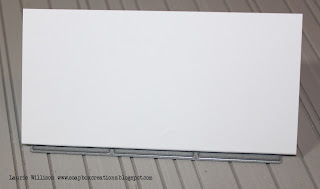 I took one piece of cardstock....not PTI because it was too thick...and cut it down to a 4x4 piece. 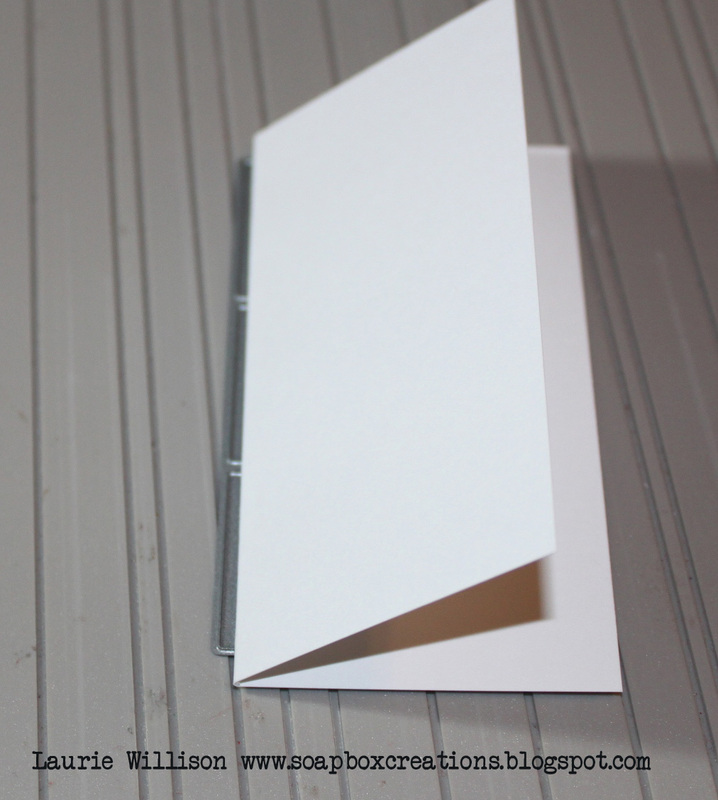 I basically just line the folded edge of the cardstock, right before the cut line on the banner die! 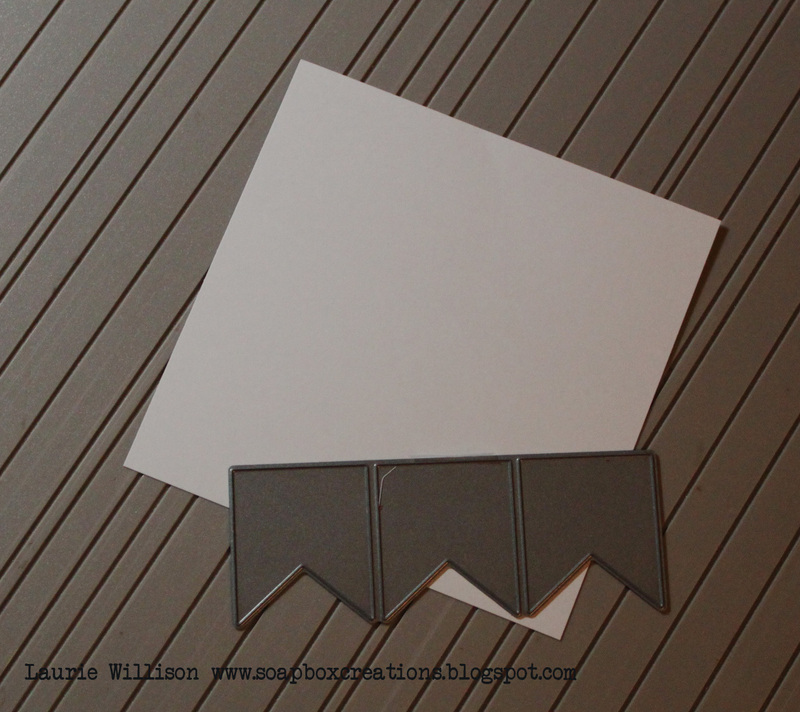 Here you can see the die sticking out so you don't cut the banners individually, but it will give it a fold! Then you have 3 hinged banners! (I know there are more than 3 in the picture but you know what I mean!) 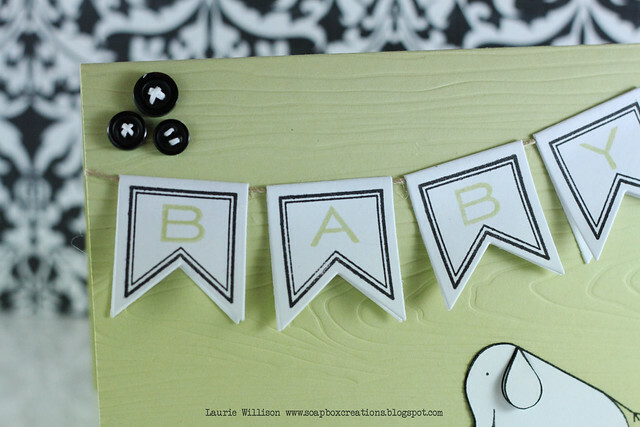 I just stamped on one side and hung them on twine! Hope your Saturday was a great one! It was so nice to have some time tonight to sit down and be crafty! I haven't had a chance in a quite some time! Have a great Sunday!! Stopping in with a quick one today! 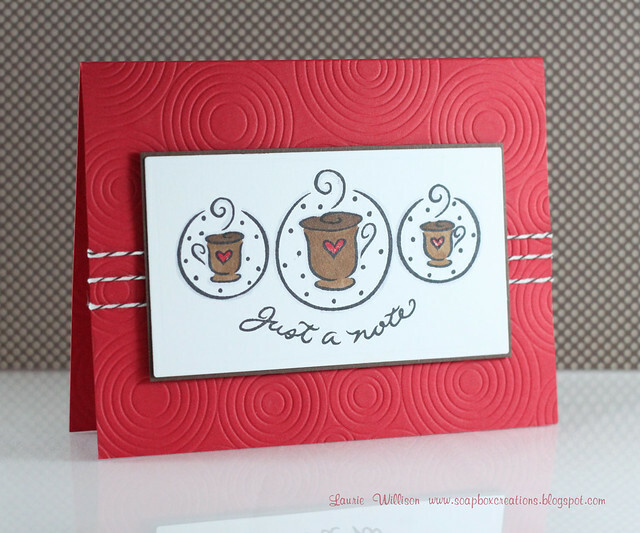 This is a card using a fantastic DeNami stamp! One stamp...easy peasy! I made this awhile back and forgot to post it! Good thing because I actually haven't sat down to make anything in quite some time! Some of you know from Facebook and the PTI forum, but my MIL and FIL are both in the hospital right now! Lots going on here which includes lots of stress! Today they are both doing much better! It is still so ironic that they are both in at the same time! That doesn't happen very often! Thank you to all of you who have sent emails and prayers! I really appreciate them! AND a quick apology to all my blog friends! I have been a horrible commenter once again! I have seen lots of beautiful creations but haven't had time to comment! I hope to get some time to leave some love soon! My reader is overflowing for sure!! Very quick and simple! I just love that PTI IP plate! So fun! Thanks for coming by! Hope all is well out in blog-land! Have a great night! 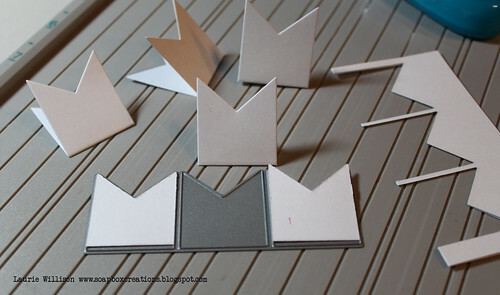 400th Post...And something NOT made out of paper! B.U.S.Y....Can't I get a little vaca?